Did your roof get damaged by a storm? Were you one of the unfortunate families that was struck by a tornado in during last year when the tornadoes were at their worst? Do you live in an area where there are a lot of thunderstorms? Whatever the reason you need roof replacement, or a new roof, you should contact Arizona Native Roofing. They are the roofing specialists that can help you with roof damage in any case, large or small, and they have lots of roofing options available to help you with all the problems that can happen with roofing in Phoenix Arizona. A Scottsdale roofer is the best source of information on the subject, but you can learn a little bit about it here too. Wickenburg Arizona Foam roofing is a very durable solution. 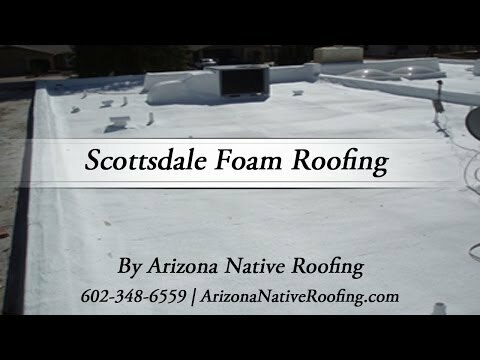 SPF, an acronym that stands for Polyurethan Foam Sprayed Polyurethane Foam, is a type of roofing style that gives a distinct approach to attack the wild heat and weather conditions right within the beautiful state of Arizona. Phoenix Arizona Foam Roofing is very light, safe, reliable, and weather-resistant. SPF also cuts down on energy costs and all the attendant noise outside. There are also unique contours that are created to help with the slope and drainage. SPF is a great thing for odd shapes and sizes, and even the weirdest roof designs can use it. It creates a long-term solution to safeguard your home and its internal contents against disaster. Foam roofing is a mainstay option. Many consumers go for it because it is extremely safe and fits into a lot of roof styles. There are so many options of what you can do with Peoria foam roofing. Luckily, this Arizona roofing company is an expert in its use if you have a particularly weird roof shape that needs accommodating. The good thing about this Phoenix roofing company is that they can determine the right style for the roofing of your home without any guesswork or estimation. They have years of dedicated practice. In addition to its southwestern culture and native appeal, Phoenix is also famous for its extreme weather. Phoenix Arizona summers tend to be very dry and hot, while winters in the state are sometimes snowy and cold. Keeping one’s house comfortable can be a challenge during extreme weather events. Even more, maintaining the internal temperature inside a house can be expensive. Rather than resigning to these high expenses of heating and cooling their houses, residents of this state are encouraged to consider foam roofing. Speak With A Shingle Roofing Contractor Today! Foam has long been appreciated for its durability and practicality in the roofing industry. This material is renowned for its ability to absorb cold and heat, thus keeping these conditions away from a home’s interior. During heat waves and cold spells, homeowners who have foam roofs notice that their homes are more comfortable and their energy bills are lower. Without this material safeguarding their homes, people might face higher energy costs and homes that are less comfortable in which to live. Some people, however, believe that their homes cannot support a foam roof. They might believe that their homes are too old or have roofs that are too slanted. This material can be molded and shaped specifically to each customer’s rooftop. Foam fits many people’s roofing needs and continues to be a wise choice among Phoenix homeowners. Contact Arizona Native Roofing today for your foam roofing needs in the Phoenix metro area including Glendale, Peoria, Scottsdale, Paradise Valley and the surrounding cities at 602-348-6559.